Summary: Ten years ago, Nicole Hunter left her troubled home behind her, unable to cope with the demands of a life with her disabled sister, Jenny. Though her search for happiness—both in career and in love—has fallen short of her dreams, Nicole pretends that all is well. Then a shattering event turns her world upside down, and suddenly, she is back in her hometown, caring for her pregnant sister and trying to heal her embattled relationship with her mother. Over the past year or so, I've enjoyed both of Amy Hatvany's books BEST KEPT SECRET and OUTSIDE THE LINES (you can read my reviews here and here.) So I was extremely excited to discover that Ms. Hatvany has yet another "new" book available called THE LANGUAGE OF SISTERS. Based on the description, this book sounded like one I'd like; and I had a feeling that it would be trademark Hatvany in that it deals with some sensitive and controversial issues. Ms. Hatvany is no stranger to writing books that deal with tough subjects as her last two books explored alcoholism and mental illness. THE LANGUAGE OF SISTERS focuses on a subject which is near and dear to the author's heart -- a disabled adult. (Ms. Hatvany explains in the back of the book that her sister was one of the first people in the U.S. to be diagnosed with a neurological disorder called Rett Syndrome.) The novel tells the story of Nicole, a woman who escaped from her troubled childhood with a special needs sister named Jenny, to discover a "better" life; however, she has found that it's not that easy to be happy... especially when you are still working through guilt from your past! When Nicole discovers that Jenny is pregnant by one of the home's workers, she rushes back home to help her. Once she's back home, she quickly learns that her mother has very different ideas about what's best for Jenny; and their disagreement adds to their already tense relationship. As Nicole comes to terms with her guilt, she sets out to be a better sister despite the heartache and work that's involved. In addition, she ultimately makes a decision that will forever change her life and perhaps help her to discover true happiness. While I enjoyed THE LANGUAGE OF SISTERS, I don't think I liked it quite as much as BEST KEPT SECRET. Having said that, it was still a very good book. I just really loved BEST KEPT SECRET! I enjoyed the premise of the story as well as the major characters, and I do think the author did a wonderful job in showing the amount of dedication and hard work that it takes to care for a disabled adult. I also enjoyed seeing the evolution of Nicole's character as she matured in all of the relationships in her life. Mr. Hatvany actually wrote THE LANGUAGE OF SISTERS over ten years ago, and I did find that there were some parts of the book that were dated, i.e. namely references to telephones. I also think that Ms. Hatvany has grown as an author over the past decade. Not that there is anything wrong with THE LANGUAGE OF SISTERS, but I do believe that Ms. Hatvany's writing and character development is more polished in her later books. There were a number of very impressive things about THE LANGUAGE OF SISTERS though. First and foremost, I really appreciated how this book explored disabled adults and their caretakers -- both the good and the bad aspects. When Nicole decides to bring Jenny home from the home and take care of her, I almost cringed because I knew it would be difficult. Little did I know just how hard it would be. Ms. Hatvany gave a honest look at the special needs of a disabled adult, as well as what the role of the caretaker, and all I can say is "wow!" I definitely do not what it takes to take care of a disabled adult -- I am lacking in both the skills and compassion. Thank goodness there are angels out there who take care of these individuals on a daily basis! In addition, I really liked the character of Nicole. She was far from perfect and she certainly was carrying some major baggage; however, I still found myself rooting for her to find some sort of happiness. I very much appreciated seeing how she grew into a better woman as she learned to handle and/or shed her guilt. In addition, I found that I enjoyed the romantic angles of her story -- both her boyfriend that she left behind as well as her new love interest. Maybe I'm just a sucker for a happy ending, but I did like seeing how her relationships with her sister and her mother evolved; and I especially loved seeing how much her renewed friendship with her childhood best friend Nova helped her to realize what's important in life. Because THE LANGUAGE OF SISTERS does deal with so many sensitive issues, I think it would make a great discussion book. There is a reading guide with fourteen interesting questions which can help jump start your discussion. Some of the topics you might want to explore include family dynamics, guilt(! ), sisterly love, obligation, sacrifice, friendships, mother/daughter issues, caregiving, anger, abuse, and forgiveness. There is also a lot of food for thought concerning Nicole and her relationships with her parents. In fact, I think you could just discuss Nicole and her issues for an entire evening! 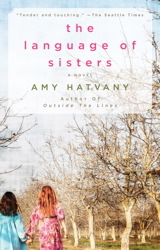 I definitely recommend THE LANGUAGE OF SISTERS to fans of contemporary woman's fiction as well as fans of Amy Hatvany. Ms. Hatvany has once again written a novel which touches upon some serious issues while also giving readers plenty to think about. You really don't read much about disabled adults and it's a difficult issue many families must face. I can just imagine what Nicole and her mother were fighting about. This sounds really good! This is a subject that should be addressed more in books. As disabled individuals mature, the burden of care changes, and siblings become more involved. Despite some of the issues you had with the book, it sounds like a good read. Great topic, and I'm sure it would lend itself to some hot discussions. It sounds like a great book (and so do her others)! This was a book I had been interested in. I appreciate your review...I haven't read her other book and may need to add that to my list as well.